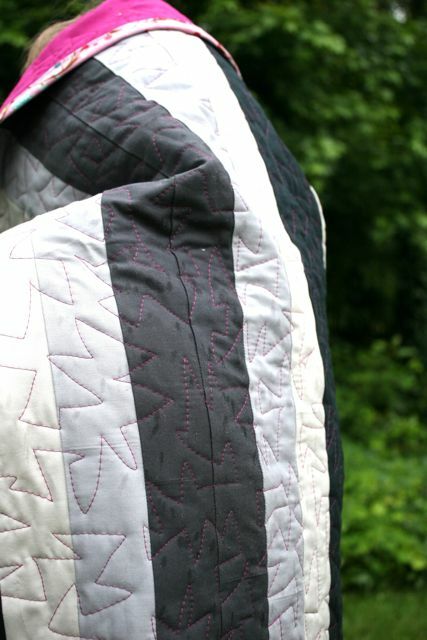 The spiky free-motion quilted project I mentioned last week is complete! And just in time for a rainy, rainy day. This is another 1600 quilt, like the Domestic Bliss one I made earlier this spring, but I actually completed this quilt top first, at our Winter Sewing Retreat. So I think this one is probably a smidge smaller than the Domestic Bliss, primarily because as I was sewing the long seams on this one, the strips got a little twisted and I may have been more enthusiastic than I needed to be as I was hacking cutting the ends. Still: lovely. The keen of eye will notice that the strips go all the way from one side to the other here–I didn’t cut off the first 18″ at the end of the first strip, and clearly that makes a giant impact. The colors here are what makes it fun, though. It’s a Silent Film jelly roll from Robert Kaufman, all the greys and blacks and sort-of-not-quite-whites from their Kona cottons. The back is all Kona cerise, with a chunk of grey dots that I randomly found in my stash. This color really is so perfect–I have to thank Diana at the shop for giving me the idea, especially since it’s going to be smashing with the hot pink four-poster in our teen’s room. She doesn’t know this is going to be hers yet, which actually made asking her to stand out in the rain holding it up a little bit funny. To me, anyway. Is that wrong? One of the many great things about these jelly roll quilts is that they’re such a breeze to stitch up that I don’t mind using them to experiment with my quilting stitches a bit. 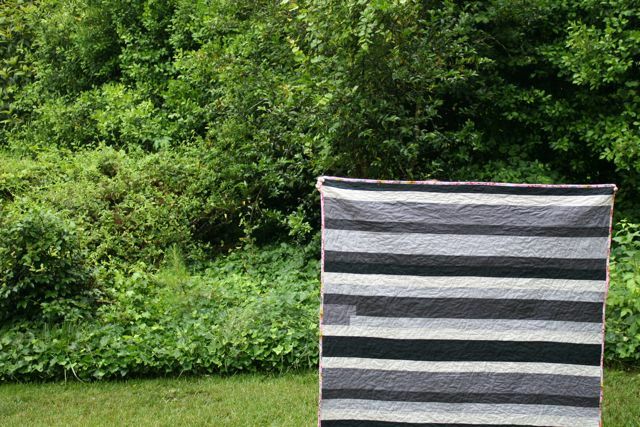 I really like the idea of marrying the quilt design to the patchwork design, but I think the temptation to just use a meandering free-motion stitch or a straight-line stitch with every quilt is pretty strong. So I’m trying to push myself more to be thoughtful about which quilting designs I use and how those interact with the quilt top to make a pleasing whole. I’m certainly not all the way there yet, but having some larger projects where I feel like I can play a bit with the quilting stitches but won’t feel as though I’ve “ruined” it if I don’t love the quilting design is helping me learn better what effect the quilting can have on the quilt as a whole–a gestalt, if you will. 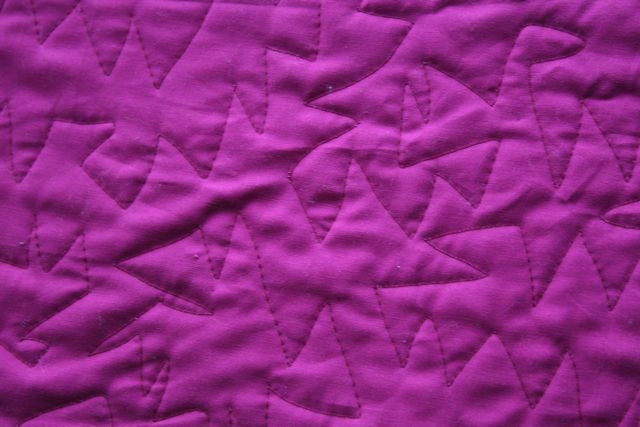 This spiky pattern seemed like such a cool way to off-set the black-and-grey-ness of the jelly roll, and I cannot get over how much I love it in the cerise thread across the body of the quilt. I liked it OK before, when it was just the quilt top–I mean, the greys were pretty cool, and kinda chic. 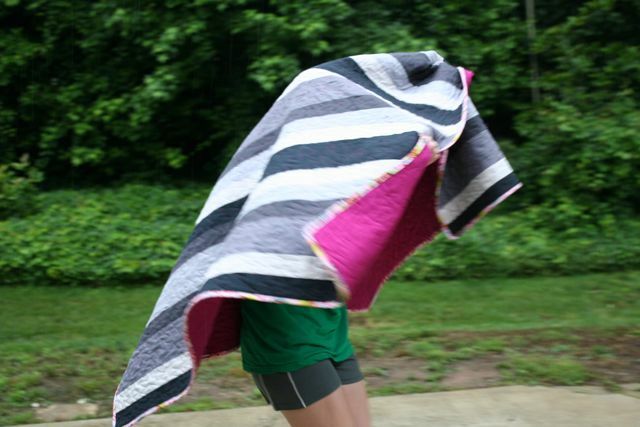 But once the stitch pattern started to assert itself and really POP against the background of these colors, I loooooved the whole quilt so much more. And that’s what I think I’m reaching for: getting to where I feel as though the quilting step isn’t just a trial to be gotten through so that I can enjoy the fabric or the patchwork, but that it’s an integral and exciting part of the process of creating a quilt, and that each of the bits stands alone PLUS working together to make a cohesive and alluring finished product. 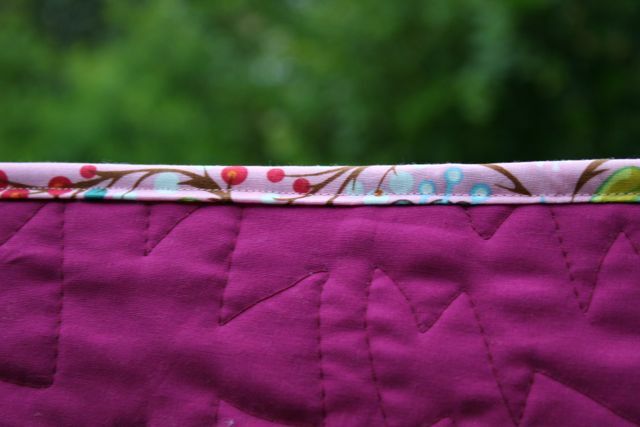 Along those same lines, the binding here isn’t the solid cerise I’d been planning, but is a bit of Anna Maria‘s Loulouthi that I’d been hoarding. And I’m over the hoarding–use ALL the fabric, I say! I like that it doesn’t quite perfectly match, that it’s unexpected, and that it really adds something soft and comforting to the colors of the quilt top. Off to run this through the dryer and then snuggle under it while it’s still warm. Hope your garden is getting the rain it needs! I LOVE it! 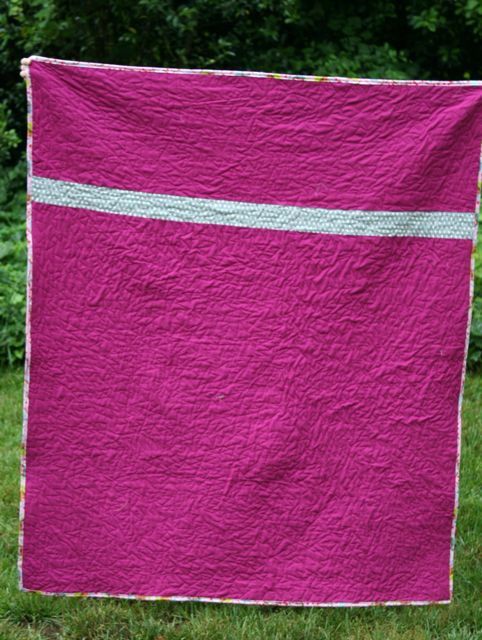 I’ve had this jelly roll in shopping carts all over the interwebs and just haven’t pulled the trigger. Perhaps I’ll change my mind now. i did a beginner fmq by following the lines of the backing and LOVE how it made the black and white front more playful. 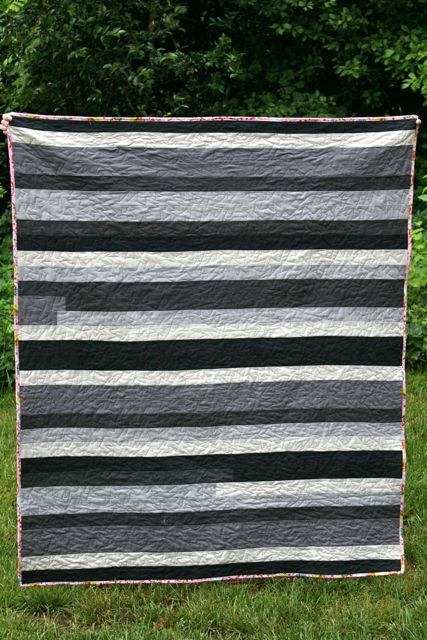 Bridgette, I love your Silent Film quilt! The quilting and patchwork are perfect.